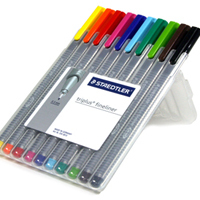 With the STAEDTLER Lumocolor universal pen, you can write on almost any surface. Whether in the office or workshop, at school or at home – Lumocolor can be relied upon to write on overhead film, glass, plastic, metal, wood and many other materials. Lumocolor non-permanent universal pens are perfect for use on paper, cardboard, film, plastic, metal, polystyrene, glass, porcelaine, wood, leather and stone. Fast-drying water-based ink is easily removed from non-porous surfaces with a damp cloth. Available individually in: Black, Brown, Dark Blue, Green, Lime Green, Light Blue, Orange, Pink, Red, and Yellow.